K-30 and K-50: does the camera's age play a role? 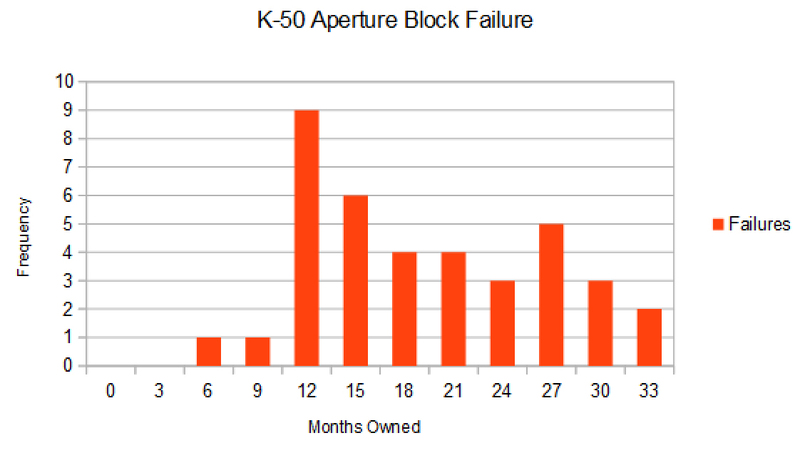 A recent increase in forum posts in which Pentax K-30 and K-50 owners reported failure of the aperture control mechanism in their camera prompted us to conduct a survey to gauge the prevalence of this issue. 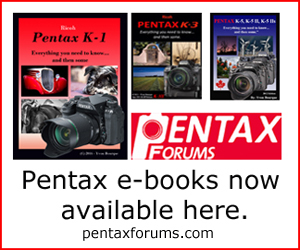 We e-mailed a survey link to approximately 5000 forum members who reported owning a Pentax K-30, K-50, K-500, K-S1, K-S2, or K-70. The survey was also made available on the forum itself as well as through social media. Responses were accepted between July and September of 2016; we are now ready to present a summary of our findings. Cameras affected by the aperture control mechanism failure (a.k.a aperture block failure) are unable to operate the lens aperture stop-down lever and thus unable to adjust the aperture of any K-mount lens, making proper exposure extremely difficult to obtain. Only lenses with a manual aperture diaphragm, such as old M42 lenses, remain usable. The long-term solution to the problem is replacement of the faulty apeture mechanism with a new part, though some users have found clever short-term fixes such as shooting long bursts or changing AA battery types to cycle and reset the mechanism. See our guide to the evolution of the Pentax K-mount to learn about the aperture control mechanism found on Pentax lenses. Up until the KAF4 mount launched earlier this year, all aperture adjustments were carried out mechanically via the camera body. 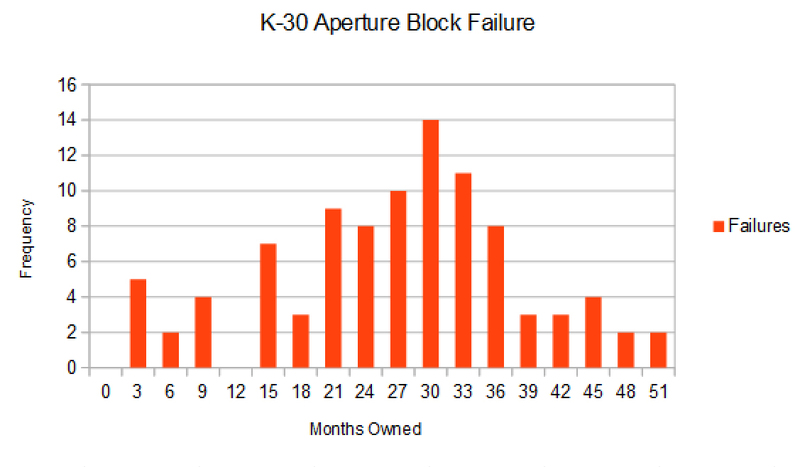 We hypothesized that the likelihood of aperture block failure would increase with age rather and shutter count. 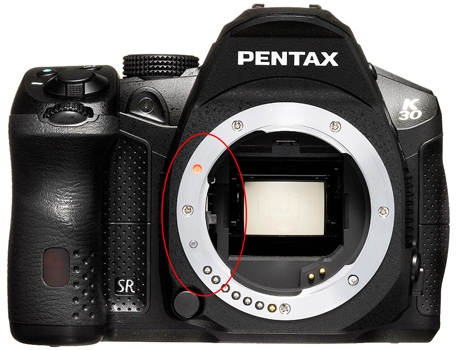 We also figured that the same issue would apply to the Pentax K-S2, K-S1, and K-500, which share their shutter hardware with the K-50 and K-30. All of these camera models were launched between 2012 and 2015. Did the aperture mechanism fail? As users from many different countries responded, we converted all foreign currencies to their current US Dollar equivalents for the purpose of determining average repair cost. We received a total of 470 responses over the course of the 3-month survey period. After removing outliers, duplicates, and invalid data points such as impossible dates, we were left with 448 responses. 143 of these, or about 32%, reported a failed aperture mechanism. No users reported owning the recently-launched Pentax K-70, which was also included in the survey. For users performing an at-cost repair, the average reported repair cost was $195.30 for the Pentax K-50 and $158.71 for the K-30. Prices ranged from as low as $20 to as high as $300 and seemed to vary greatly between different regions. User comments gave us additional insight into the fate of their cameras. A substantial number of users reported receiving free repairs from Pentax despite being outside of warranty. Others received reimbursement from third-party warranties or insurance policies. Those who decided not to obtain a repair at-cost either sold their cameras for parts (and moved on to another system in anger), traded up to a flagship model such as the K-5 or K-3, or kept them for use with M42 lenses. The Pentax K-30 and K-50 were by far the best represented in the survey, so we decided to turn most of our attention to those two cameras. Of course, it's good news that far fewer failures were reported by K-S2 and K-S1 owners. A proportionally high number of failures was reported for the K-500, but as this camera was targeted at a narrow market segment that generally does not frequent our site, the unusual result is likely due to response bias. Similarly, it's conceivable that actual failure rates even for the K-50 and K-30 are far lower than what the survey suggests. Looking at Table 1, we observe that the K-30 was more likely to fail than the K-50, at approximately 37% versus 27%, respectively. Note that K-30 is about a year and a half older than the K-50 and K-30 production stopped at about the same time as the K-50 was launched. 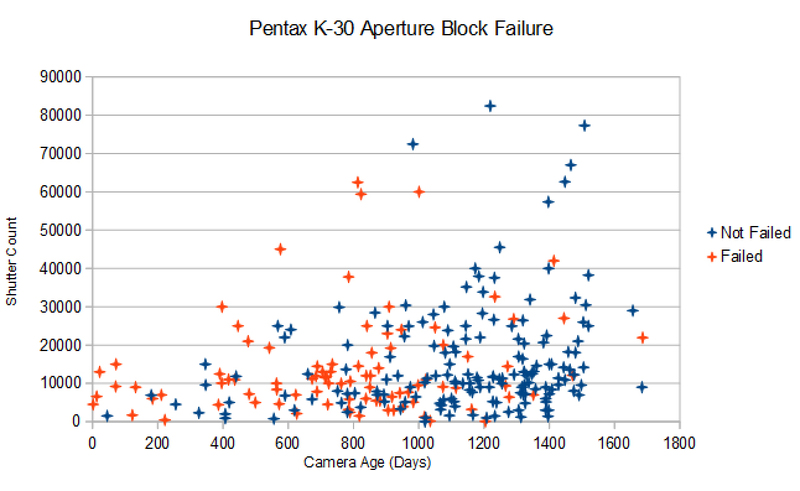 To see how (or if) camera age and shutter count affected aperture block failure, we created a scatter plot of both these metrics and marked cameras with failures in red. Camera age was calculated as the number of days between acquisition and failure, or the date of the response if the camera did not fail. Beyond showing us that most K-30 users maintained a fairly low shutter count, this plot did not reveal any clear correlation between shutter count and and camera age. 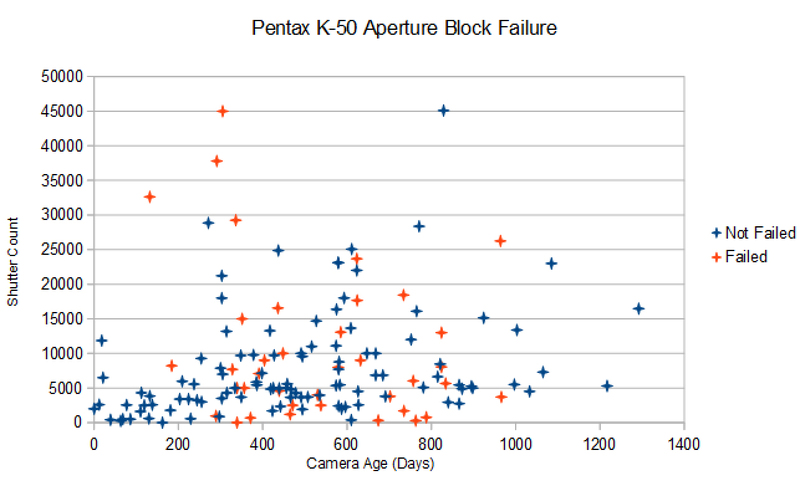 Chart 3 shows that the likelihood of a failure increased with camera age, up to about 30 months. A jump occurred after about 1 year. We repeated the same analysis for the K-50 data and once again saw mostly low shutter counts. In the case of the K-50, fewer cameras appeared to fail early on— but as a newer model, the K-50 hasn't had the chance to lie around on store shelves as long, either. Interestingly, though, the histogram in Chart 5 reveals a similar trend to the K-30: at the 1-year mark, we see a jump in failures. 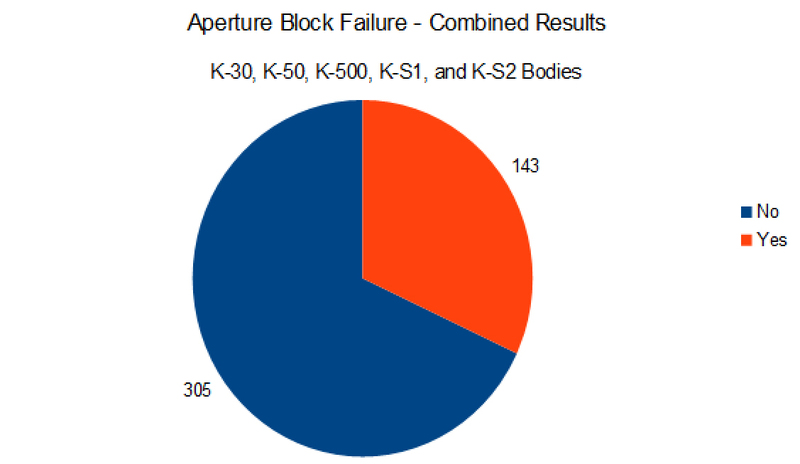 The survey results allow us to draw a handful of conclusions about the aperture block failure issue. First and foremost, we were able to confirm that this not an uncommon problem for Pentax K-30 and K-50 bodies— especially those older than one year. Having offered free out-of-warranty service to a handful of customers, some Pentax repair facilities have also acknowledged the existence of the issue while providing excellent customer support. Failure rates do not seem to be significantly affected by shutter count, though camera age seems to plays a role. 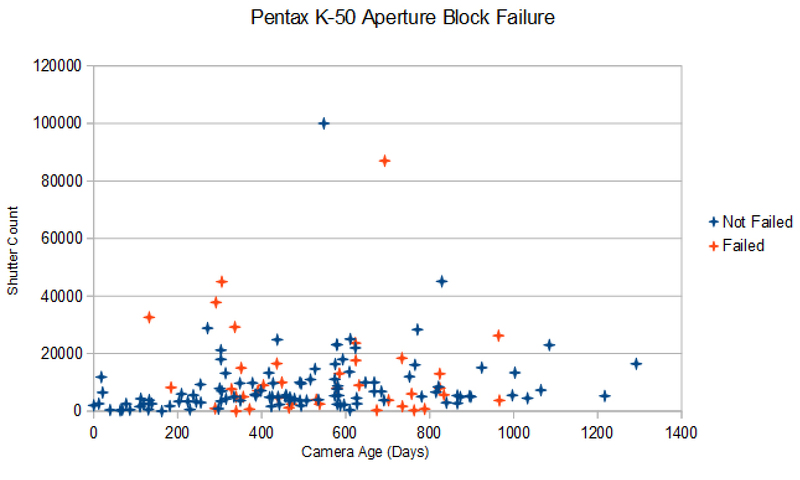 Another secondary finding is that the more recent Pentax K-S2 (and therefore possibly the new K-70) is not immune to failures. While we currently cannot accurately measure the failure rates of these cameras, the data from this survey fortunately suggests a decrease in failures for newer models. As with any survey, bias can skew our results away from actual trends in the larger camera population. The key bias in our case is nonresponse bias, as disgruntled users as well as Pentax fans were more likely to respond to the survey than happy users or those who aren't as tech-savvy. To put things in perspective, our records show that we have at least 1799 K-50 owners and 2659 K-30 owners on the forum, so overall survey participation was at most 10% of our user base. As very few owners responded from outside the forum, undercoverage was a second source of bias. If more than a third of all K-30 bodies in existence had failed by now, we would hear much more about this issue! Fortunately, this bias leads mainly to the over-estimation of the aperture block failure rates. Since our other findings are based solely on cameras reported to have failed, those results could only have been skewed by response bias— and to that end, we eliminated any data points that contained unusual values or in which users exhibited confusion through answers/comments. More importantly, while we asked for date of purchase in the survey, we did not collect any information on camera manufacture date. Having this information could potentially have painted an even clearer picture of when (or even why) these cameras tend to fail. If your camera's aperture control mechanism fails, don't panic! Contact your local service center to see if you even have to pay for the repair. Note that Pentax has not issued any service advisories or recalls related to this issue, so free service outside of warranty is not a guarantee. If the repair quote is higher than the value of the camera, consider selling it as-is to fund an upgrade to a body not affected by this issue, such as a member of the K-3 or K-5 family. For peace-of-mind, if you are buying a new Pentax model like the K-50, K-S2, or K-70, consider purchasing an extended warranty from Pentax or a third party. For help with getting your camera fixed, please visit our repairs and warranty service forum.